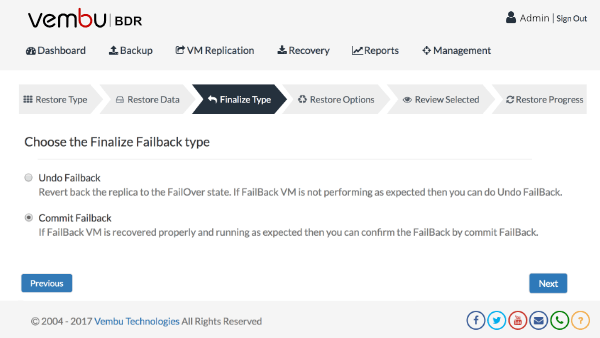 If you want to resume the source VM operation after disaster recovery and shift the production load back to the source VM or ESXi host, you can use replica failback feature. Vembu VMBackup offers VM replication feature for high availability of business critical VMware vSphere VMs. It frequently replicates VM data from source ESXi host to target host. In case, source VM is temporarily not reachable due to any disaster, replica VM can be instantly failover on target host and all production workload will be shifted to the failover VM. 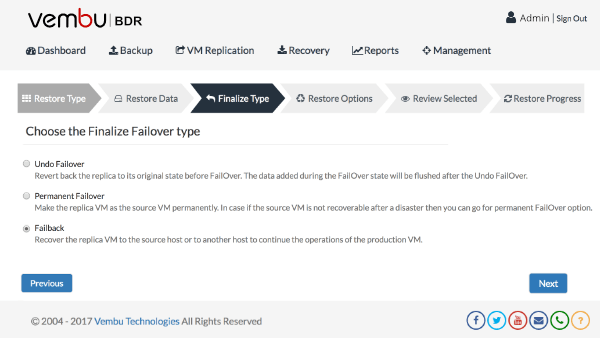 After sometime, if source VM is back and if you want to shift the workload back to the source VM and also restore the VM data created in the target VM after failover process, IT admins can use failback feature. Failback is a temporary process and it needs to be finalized based on your requirement. Undo Failback is useful, when the failback process is not successful or the VM was not performing well after failback process. Undo FailBack helps to revert back the failed back VM to its original state (ie., failover state). The VM snapshot created after failback process will be terminated and the VM will be reverted to failover state. If the failed back VM is recovered properly and running without any performance issue as expected then we can confirm the failback by committing it. Commit Failback is the confirmation process of failback.